Multiple screens, center screens, and projection onto the wall are all very common in today’s multi-complex ministries. Multiple screens have the advantage of projecting different views on each screen by using a composite or XGA matrix switcher. The matrix switcher may also be used to send video distribution through out your facility or signal to your record deck. There are a number of video switchers to choose from with many different advantages. The main difference is the quality of signal. There are composite switchers and XGA switchers. Another difference is that some are seamless switching and others may have a small glitch when switching. Phillips Pro Systems can walk you thru the many combinations and give you recommendations on the proper switcher. The rear wall projection is a great way for the pastor to review his sermon and for the choir to view song lyrics, eliminating the clutter and cost of hymn books. Video distribution is also common in the stage area, using video monitors for the same purpose. 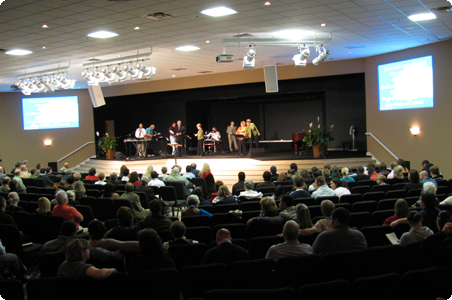 You may also want to think of the addition of a computer input into the Alter/Stage area for future conferences and power point presentations from the Altar/Stage area. Phillips Pro can also assist you in pan and tilt cameras remotely run from the tech booth location or manned production camera choices. We can also incorporate the use of a production digital video switcher used in TV ministries. Phillips Pro can accommodate existing buildings as well as provide all plans and written documentation for new and renovated construction needs. We work closely with the architect and electrician and you the church, representative to provide all the details for a smooth transition into exiting or new facilities. With 25 years experience, we’ve been around long enough to understand your needs and how to accomplish your goals. Please call and receive a complete package on a step-by-step process required for the development of sound, lighting, and video systems that work for you. Lighting is a key element to good video production. You may want to ask a Phillips Pro representative for advice on good lighting for production use. We also offer Audio / Video Furniture.